Mizoram Chief Minister Lan Thanhawla inaugurated the Institute of Bio-resources & Sustainable Development (IBSD) in Aizawl on Saturday. Professor Dinabandhu Sahoo, Director, IBSD was present on the occasion. After venturing in Manipur, Meghalaya and Sikkim IBSD, a National Institute under Department of Biotechnology, Government of India, New Delhi formally enters into Mizoram. The mandate of IBSD is to bring socio-economic development in Northeast India through sustainable utilization of bioresources. Mizoram Chief Minister Lan Thanhawla on Saturday inaugurated IBSD at Aizawl, the capital of Mizoram, in presence of Prof Dinabandhu Sahoo, Director, IBSD at Nursery Veng, Aizawl. While inaugurating the state-of-the-art facility, Lan Thanhawla lauded IBSD for several initiatives in Northeast. In his speech, Director IBSD Prof Dinabandhu Sahoo said that presence of IBSD will bring together different departments, institutes and universities which will create a biotech hub in the region through technological interventions and develop technological packages. It will undertake human resources development for sustainable utilization of bio-resources for creation of jobs and economic development of Mizoram. The facility will provide training on production, post-harvest management and marketing to the farmers and unemployed youth, said Prof Sahoo. 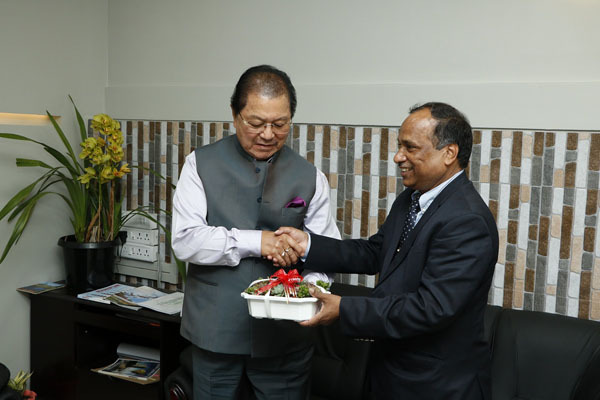 He added that Mizoram has a huge potential to become a biotech hub in the country due to its rich biodiversity, climatic conditions and good air connectivity. IBSD will focus on value addition to Bamboo and other crops unique to Mizoram. It may be mentioned that IBSD has been promoting cherry blossom (Sakura) initiative in North East and organised India’s First Cherry Blossom Festival in North East in 2016. I am sure Mizoram will not only become a major tourism destination but a role model state in the country, said Prof added. Some of the Objectives are establishment of pilot protected cultivation facilities for production of high quality horticultural, agricultural and ornamental crops at IBSD Hub Mizoram along with open field demonstration of innovative technologies for the production of french bean, birds eye chilli, Sticky pumpkin in open conditions at farmers’ level in Mizoram.